Successfully shepherding a crowd of rowdy kids is a challenge, and that's just what the team at School-a-Thon does every day at schools across the country. Needless to say, fun always works well as a motivator for children. When School-a-Thon needed a way to huddle up all the kiddos, they chose an inflatable archway to clearly mark the starting line of their popular Color-a-Thon races. "The arch [is] a very visible and fun way to show the kids where to gather for the start of the race," says Rick Anderson, owner of School-a-Thon. 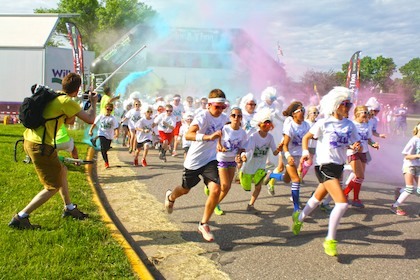 "We wanted to make a huge impression on the kids, parents and teachers at the beginning of the Color-a-Thon races." Not only does the Color-a-Thon inflatable arch serve as both a starting point and finish line, but it also makes a great photo backdrop. Appearing in many press shots of local events, the arch has helped accomplish School-a-Thon's mission of raising much-needed funds for field trips, sports activities, supply drives and more. Because the Color-a-Thon events are held all over the nation, the arch needed to be easy to set up and transport. With lightning-fast inflation and deflation times plus the ability to simply roll up the inflatable and pack it away, portability has proven to be a snap! Two thumbs up for raising the level of fun and funds! Contact us today for a custom inflatable archway!